Hello everyone! My name is Lisa, from the food blog Greek Vegetarian and I'm delighted today to be writing a guest post for Diane's wonderful Simple Living and Eating blog – especially given it's Mediterranean Diet Month! Although the Mediterranean diet has been around for thousands of years, it has only recently gained recognition as one of the healthiest in the world. But the Spaniards, Italians and of course the Greeks knew that a long time ago. Lentils, for example, have been a part of Greek cooking for millennia. High in protein and loaded with minerals, the ancient Greeks knew they were on to something when they introduced lentils as a staple in their diets over 8,000 years ago. Many people don't know that the Greek diet is largely plant-based with a very low meat component. When you think of Greek food you might imagine a big plate of shaved lamb off the spit. It's true, this dish represents an element of Greek cuisine, but meat isn't really considered an essential component of the Greek diet and spit roast lamb is usually only served up on special occasions. In fact, for a significant part of the year, many Greeks observe fasting periods such as those leading up to Easter and Christmas which means abstaining from meat, fish and sometimes even eggs and dairy products. The Greeks have become quite the masters of vegetarian eating, making the most of beautiful fresh vegetables, fruits, whole grains, nuts and legumes. And not just because of their fasting periods. In earlier times most families couldn't afford meat, but their own fields provided them with such an abundance of plant-based foods to feed their families that meat was not missed. Today's Greek diet is still rich in fresh produce and unprocessed ingredients, and having a low red-meat content it is no coincidence that the Mediterranean diet can protect against heart disease and stroke. Studies also show that eating as the Greeks do can lessen your chances of developing cancer, diabetes and obesity, and lowers cholesterol and blood pressure. As a vegetarian, I focus on the vegetable, grain and legume aspects of Greek cuisine and let me tell you, there is no shortage of deliciously healthy dishes that can be created from the plethora of fresh ingredients that make up the vegetarian Greek diet. Olives, eggplants, tomatoes, honey, feta cheese, mint, pistachio nuts, oregano, almonds and cinnamon are just a few of the many flavor sensations that are found in traditional Greek recipes, and with ingredients like these, it's no wonder Greek cuisine lends itself so well to a healthy, vegetarian diet. I swear my Aunt Koula has a Greek recipe bible stored in her head and her cooking skills and techniques are well practiced. Needless to say she is my main source of inspiration and education when it comes to Greek cooking. Last year she and I shared some time in the kitchen on the Greek island of Limnnos where my dad's family is from. We have an old family house where we stay when we are on holiday on the island (I know, we are very lucky!) and family members come from the mainland of Greece and from Australia to spend the summer months together in Limnos. Lunch with the family outside on the terrace is the best part of the day and usually involves lots of laughter, waving of hands, good conversation and clinking of drinks. On the table would be a basket of warm crusty bread from the bakery around the corner, a huge Greek salad made from vegetables freshly picked from the garden that morning, and a tray of rice and herb stuffed tomatoes that Koula had only just taken out of the oven. The recipes for this simple but gorgeously colourful and healthful lunch are what I want to share with you today. Arrange lettuce leaves in the bottom of a large salad bowl. Place remaining vegetables, followed by the mint and feta cheese over the lettuce leaves. In a small bowl, whisk the oil, lemon juice and vinegar until combined and pour over salad. Using a sharp paring knife, remove the tops of the tomatoes and reserve for later. Carefully scoop out the tomato flesh using a spoon, taking care not to pierce the skin. Reserve half of the pulp and discard the rest. 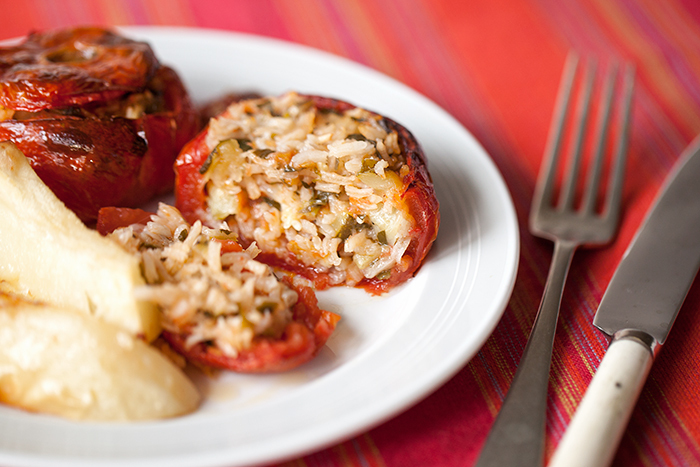 Place the tomato shells in a baking dish and set aside. Fry spring onions and zucchini in 50ml of oil over low to medium heat for 10 minutes, stirring, until lightly golden. Add tomato pulp, parsley, mint, rice and 100ml of water and stir well. Allow to simmer uncovered for 5 minutes and season with salt and pepper. Fill the tomato shells almost to the top with the rice mixture, leaving room for the rice to expand, and replace tops on tomatoes. Arrange the potato pieces between the tomatoes to help keep them in place and carefully pour the remaining 100ml of water, followed by the remaining 50ml of oil around the vegetables. Cook for around one hour. You are very welcome... so glad to have you. Diet or no diet - these are 2 wonderful dishes!! I'm a vegetarian and I love the salad and love the stuffed tomatoes. You are so right... good food is good food. It is great when it is healthy too. I hope you will visit Lisa's blog and check out more of her recipes. Beautiful recipes Lisa and I love hearing your stories of Limnos. Healthy lunches with your family sound like they are very enjoyable. Thanks Jenny, stop by Lisa's blog and post a message there too. I'm sure she will appreciate it. The stuffed tomatoes are beautiful! These look like great recipes. wow those look yummy and thank you for adding my recipe! 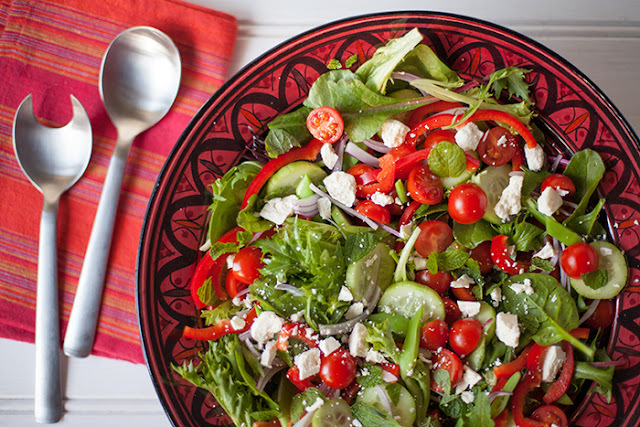 I love Greek salad but have never made it. Thank you for sharing the recipe. I am serving it this week! You are so welcome. This is a guest post so you might want to check out Lisa's blog for more great greek vegetarian recipes. We love your site - and the menu plans - and yummy food! Thanks so much for taking the time to share this on BeBetsy BRAG ABOUT IT Tuesday. Thanks so much, so glad I know about your party now. You are welcome back anytime. Your recipes are very popular here: High views. Hope you will come to the food party tomorrow with more of your delicious and healthy recipes. looks amazing want this for lunch. thanks for linking up to Friday food frenzy! Thank you for sharing your lovely salad at FF. Pinned! Thank you be sure to check out Lisa's blog. Hi, your greek salad looks so good. I saw it on Friday food frenzy! Thanks so much, this is a guest post, please check out Lisa's blog. My favorite salad is a Greek salad and those tomatoes look great!! Thanks so much for linking up to Friday Food Frenzy! You are very welcome thanks for stopping by. This is a wonderful post and I can't wait to try these recipes, they look delicious. If the storms will just stop long enough so we can get some cooking done, we are so grateful that all of our family is safe! Thank you so much for sharing with Full Plate Thursday and have a fabulous weekend. You are very welcome Miz Helen... this has been quite a year for weather. Glad to hear your family is safe. I love salads and saw this at Marvelous Monday - so had to stop by to saw - this looks awesome! Thanks for coming by Deb. This is a guest post so please check out Lisa's blog for more great greek food. It's the best I love the mixture of sweet tomatoes and salty olives and feta... yum. 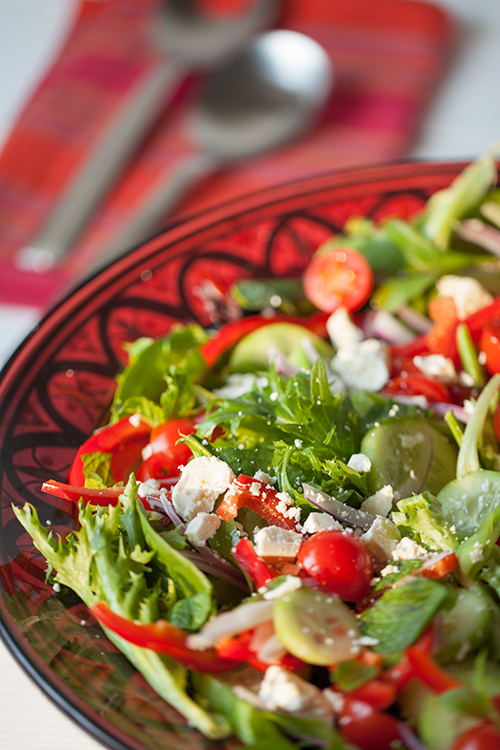 A Greek Salad is always one of my favorites. Your photo is beautiful! iPad Mini Giveaway! Happy Memorial Day!